The Elections are fast approaching!!! Reserve your fire truck today!!! Running for local office on a tight budget? Smokey’s Fire Trucks are surprisingly affordable. There is nothing more impressive than campaigning on a fire truck, for a local, statewide or national campaign. When running for office, your time is limited. You need to get your message out to the voters and be remembered. Smokey’s Fire Truck Events can help! Nothing beats the power and presence of an all American fire truck. A fire truck really gets you noticed! 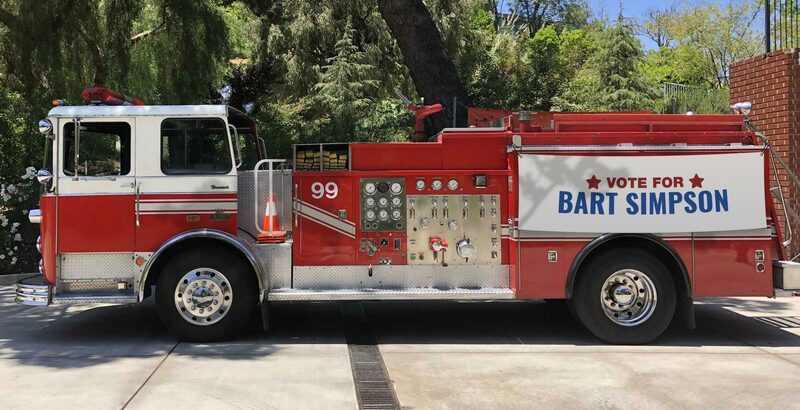 While you are busy with other campaign events, a fire truck, carrying your campaign banners and message can be driving and covering your district to get your name and message out. Need to make several campaign appearances? Have you and your campaign staff arrive on a fire truck and give your speech from the ultimate platform, a fire truck carrying your banners! Smokey’s has been hired by statewide campaigns as well as local city campaigns. We have seats and seatbelts in the back hose bed of the fire truck to carry you, your family and your campaign supporters. Call today to reserve the most effective campaign tool around! Receive Discounts, Updates, & More! © 2019 Smokey's Fire Truck Event. All Rights Reserved.